Its clear from the off that Warren's film is inspired by the like of David Fincher, hoping to weave a tight, emotional and tense serial killer story that would take an audience on one hell of a journey. Whilst the film has some good ideas, it unfortunately falls short on most of its goals. The film unfortunately doesn't look great, often out of focus and unimaginative in it's cinematography. But every now and then there is a flair or flourish peeping through. The odd shot that does a perfect job of telling the story well. The performances are generally flat with the exception of the detective who manages to create a fairly 3 dimensional and the reporter who gives a brave and venerable performance through out the film. The story chugs along, ticking the cliché boxes and doing everything you'd expect it too and then every now and then it manages to pull the rug from underneath you with genuine twists I didn't see coming. 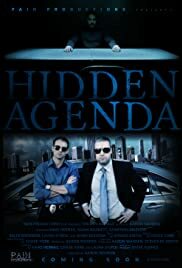 Overall Hidden Agenda isn't the worst indie flick I've seen, it has it's moments but I do feel like the film makers have better in them. I look forward to seeing what they come up with next.